Clutch is a B2B ratings and reviews platform whose mission is to connect buyers with the best service providers throughout the globe. The companies they feature belong to a wide range of industries, including development and IT services, advertising and marketing, web design and creative services; however, their segment of leading video production companies is one of the newest and fastest-growing on their site. Attack Studios is very proud to be included in Clutch’s research and that we are distinguished as one of the best video production companies in Chicago amongst the other firms listed. To get to the top on Clutch, there were a variety of factors that contributed to our ‘market presence’ score. Attack Studios was first evaluated via Clutch’s long-standing methodology that measures our market presence in the video production space. By examining the list of our established client base, the description of the services we offer, and case studies of successful campaigns we’ve executed for our clients, Clutch was able to identify Attack Studios as one of the best agencies in our field. Their sister website, The Manifest, also has us listed on their directory of the best video production companies in Chicago in 2018, which is another online database that collects research of the best B2B providers worldwide. The largest component to our listing on Clutch, however, is attributed to the reviews our clients have given us. 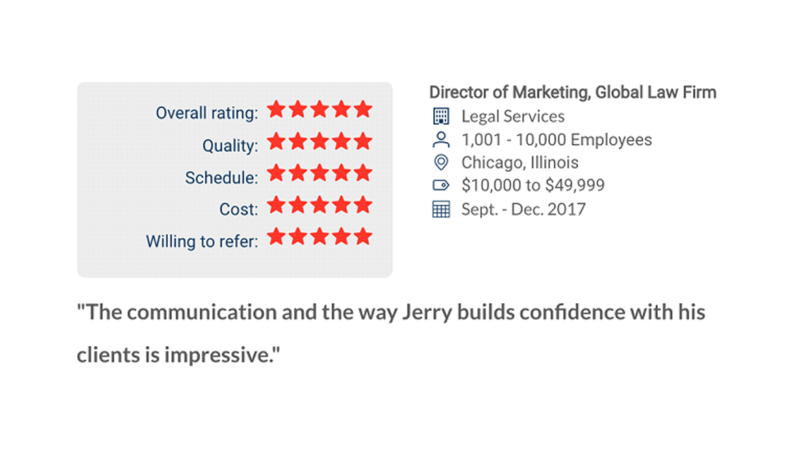 In firsthand interviews with our clients, Clutch dives deeper into the partnerships we’ve maintained with our partners to gain an accurate and thorough understanding of our ability to deliver quality results. We’d like to thank our clients for taking the time to reflect on their experiences working with us. Telling your story is our favorite part of being a video production agency, and we’re incredibly grateful that you were willing to tell our story as well. Moving forward, we plan to maintain our successful client partnerships and even forge new ones to keep our spot at the top on Clutch.